Earlier this month, rumors surfaced that PALM was actively looking for a buyer for their company. The rumors were proven to be true after Bloomberg.com revealed earlier this week that PALM had hired Goldman Sachs and Qatalyst Partners to flesh out potential acquisition partners for the company. Traders heard the word "buyout" and immediately pounced on the stock, sending it soaring. 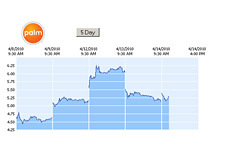 PALM, which had been languishing at about $4/share, suddenly shot up to $6 on the news. In true Pavlovian fashion, traders hadn't bothered to contemplate exactly what the news meant or the reasons for PALM to be looking for a buyer - instead, they heard the "bell" (buyout) and leapt into action. Here's the problem - PALM is not negotiating from a position of strength AT ALL. The company has basically admitted that it can't compete with the likes of Apple and Research in Motion and has folded its tent. PALM's main problem, aside from intense competition, is that it is running out of cash. Most analysts agree that PALM has enough cash to last for another 12 months or so. Now, with PALM's shares languishing as of late, and with the company basically running up the white flag, it would seem foolish for a company to come along and offer up a big premium for the company. This is clearly what many investors/traders in PALM were hoping for, but it seems very unlikely at this point. Companies who are actually interested in PALM may prefer to see the company rot on the vine a bit before swooping in with a buyout offer. I'm not an expert on all things PALM, but it seems to me that an acquiring company could pay a great deal less if they waited a quarter or two. PALM's recent run-up (and subsequent decline) teaches a valuable lesson - just because you hear the word "buyout", don't start blindly buying with reckless abandon or else you might get hurt.